This new book is a practical guide for physicians and other professionals who care for children and adolescents with complex, chronic diseases. These disorders are a challenge because they require multiple services, the information about the disorders are scattered, and the exact treatments are not available in standard texts. To overcome these barriers, this book provides a summary of the clinical features, laboratory diagnosis, and the general and specific treatments needed for optimal care of these children. The key points are presented in a clear, succinct format, providing recommendations that can be implemented within the time span of an office or emergency room visit. Furthermore, pitfalls that are encountered are emphasized and alternatives are suggested. This book not only provides a disease specific guide, but also instructions for creating a medical home, information on disease-drug interactions, and references for further study. Albert Einstein once said, "Everything should be made as simple as possible, but not simpler." This is what Drs. 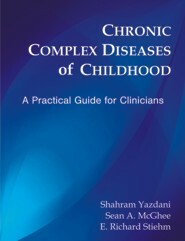 Shahram Yazdani, Sean A. McGhee, and E. Richard Stiehm have accomplished with Chronic Complex Diseases of Childhood: A Practical Guide for Clinicians. The editors, faculty members at UCLA's David Gefffen School of Medicine and its Mattel Children's Hospital, assembled a first-rate group of contributors, almost all of whom are from institutions in Southern California. The compendium, which consists of 17 sections, begins with a description of the "medical home," defined by the American Academy of Pediatrics as a "model of delivering primary care that is accessible, continuous, comprehensive, family-centered, coordinated, compassionate, and culturally effective," and ends with sections on medical devices, drug interactions, and stem-cell and organ transplantation. The 14 other sections, with their own table of contents, are divided alphabetically by disease category, from cardiac disorders (starting with atrial septal defect and ending with ventricular septal defects) to rheumatologic disorders (Behcets disease to systemic lupus erythematosus), into highly readable individual chapters of three to five pages. The one exception is the chapter on thombophilia and childhood thromboses in the hematologic disorders section, which runs to seven pages. .
Each chapter is uniformly organized into etiology; clinical presentation and prognosis; presenting signs, symptoms and natural history; diagnosis; management; and pearls and precautions. Lacking in expertise, the busy generalist (whether in pediatrics or family medicine) with a patient in need of a stem cell transplant, for example, could use this book as a handy resource to familiarize himself or herself with the subject of stem cell transplantation when talking with the parents or the child's pediatric hematologist. . While Chronic Complex Diseases of Childhood is no substitute for a more comprehensive standard pediatric textbook, or for books and monographs devoted to a single group of disorders (e.g., genetic conditions), it should be on the bookshelf of every physician, physician's assistant and nurse practitioner who cares for children. Shahram Yazdani received his MD from Tulane University and completed his training in pediatrics and fellowship in medical education at the David Geffen School of Medicine at UCLA. He is currently an Associate Professor of Pediatrics at UCLA where his clinical efforts and research have been focused on pediatric rare and complex/chronic diseases. He has published articles on improving the care of children with complex diseases and education of residents in dealing with palliative and comfort care of these patients. Sean A. McGhee received his MD from Stanford University and is currently the Dorothy and Robert Keyser Assistant Professor of Pediatrics at the David Geffen School of Medicine at UCLA. He has published on immune deficiency disorders and genetic epidemiology and runs the Clinical Immunology and Allergy Training Program at UCLA. E Richard Stiehm, MD is Professor of Pediatrics in the divisionof Pediatric Immunology/Allergy/Rhematology at the Mattel Children's Hospital at UCLA. He is a graduate ofthe U Wisconsin Medical School, a pediatric resident at Babies Hospital In NYC, and an immunology fellow at UCal San Francisco. He has been at UCLA since 1969. His interests are primary immunodeficiency, neonatal immunoloogy and immunoglobulin therapy. He is the author/editor of over 500 articles, chapters and books.